CAMP LUKBAN, Catbalogan Samar – The 8th Infantry (Stormtroopers) Division, Philippine Army formally kicked off the month-long celebration for the Christmas season with a ceremonial switch-on of Christmas lights held in front of its Headquarters building here. 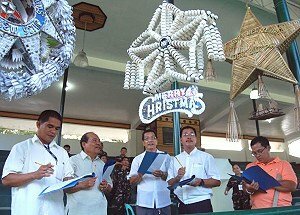 The switch-on ceremony, preceded by a Christmas lantern contest was witnessed by civilian guests, military personnel, civilian employees, military dependents and other civilian personalities from Catbalogan. In a simple program Dr. Dominador Q. Cabanganan, Ph.D., one of the judges in the lantern contest, in his message, saluted the 8ID for the good work and acknowledged the Command’s continuing effort of rendering service to the people of Samar Province. He expressed his feelings of delight seeing the craftsmanship of the Stormtroopers as evidenced by the colorful lantern entries made of indigenous materials. He also, appreciated the 8ID’s unique way of observing the Yuletide Season through the ceremonial switching of Christmas lights that illuminated the entire 8ID Headquarters Building and its peripheries. Major General Mario F. Chan, commander of the Army’s 8th Infantry Division said that the switch-on of Christmas lights is just one of the activities lined up for the month-long Christmas celebration. Others are Search for Christmas singing soldier, sports fest which aims to promote sports development, camaraderie, esprit-de-corps and sportsmanship among the military personnel and a variety show during the stormtroopers night. The activity will be highlighted by raffle draw among the personnel of the Command. After the ceremony, Maj. Gen. Chan distributed Certificate of Appreciation to the jurors of Christmas lantern contest which was followed by one minute fireworks presentation while the 8ID choirs with Stormtroopers Band sings Christmas carols to the delight of the audience. This is the 8ID’s way of celebrating the Christmas season, as the Command believes that spirit of Christmas should be enjoyed and cherished by all peace-loving Filipino citizens of the country. MANILA – The working group on criminal justice process was launched today in Tacloban, as part of the "Call for Action" initiative, which addresses the causes of jail congestion and its consequences on health and living conditions of inmates. The working group brings together representatives of the Bureau of Jail Management and Penology, Philippine National Police, Public Attorney's Office, Integrated Bar of the Philippines, judges and prosecutors, and is facilitated by the International Committee of the Red Cross (ICRC). The participants will identify the challenges in processing the cases of inmates in Tacloban City Jail, and propose concrete solutions to speed up the process. "This is the second working group launched in the Philippines to address the causes of jail congestion, - says Christoph Sutter, deputy head of ICRC delegation in the Philippines. Previous example of Manila City Jail demonstrated that by sharing information between agencies concerned we can tackle legal and procedural problems leading to overcrowding." Also in line with the "Call for Action" process, the ICRC has initiated rehabilitation projects in Tacloban City Jail, building a new infirmary, kitchen, and improving water facilities. The ICRC works to promote dignity and respect for those deprived of liberty by monitoring their treatment and living conditions. In 2007, the ICRC launched the "Call for Action" process to help authorities upgrade penal infrastructures, tuberculosis management in jails, and the criminal justice process. CAMP LUKBAN, Catbalogan, Samar – As a result of pursuit operations conducted by the troops of Alpha Company of the 8ID’s 87th Infantry Battalion in the hinterlands of Northern Samar, one (1) regular member of the terrorist New People’s Army (NPA) was apprehended at Brgy Osmeña, Las Navas, Northern Samar at around 1: 32 p.m., November 29. The CT member was identified as Domingo Hinandoy alias Ninoy, a full time guerilla member. Hinandoy revealed that he had participated in a series of combat activities, like ambush in Jipapad and Gamay of Eastern Samar and Northern Samar, respectively and a squad member of alias Jessie (true name unknown) an identified recruiter at Sinunugan de Tubang, Sivino Lobos, Northern Samar. He also named some personalities belonging to his squad. In a report made by Lieutenant Colonel Leo Lorenzo Madroñal, commanding officer of 87IB disclosed that the unit acted upon a report text by the local populace regarding a band of CT’s conducting extortion activities in their area. Meanwhile, Major General Mario Chan, chief of the Army’s 8th Infantry Division commended the soldiers for a job well done. He likewise extends his thanks to the people of Brgy Osmeña, Las Navas of Northern Samar for the information that was timely provided to the soldiers. “If these cooperation from civil society will continue, we can easily defeat or totally eradicate the insurgents that hampered our peace and development here in Eastern Visayas”, Major General Chan adds. As of press time, Hinandoy is undergoing custodial debriefing at the Headquarters of 87IB for further filing of appropriate charges. TACLOBAN CITY – More than one thousand day care workers from all over Leyte were recently given cash incentives as the provincial government poured in more or less P1.1 million budget to distribute such. A total of 1,368 day care workers received their respective cash incentives based on the number of years they have served as such in their barangays. Day care workers who have served 7 months to 4 years each received P600; 5 years to 9 years P800 each; 10 years to 19 years P1,000 and 20 years and above P2,000. Day care officers also got a cash incentive of P600. Leyte Governor Carlos Jericho Petilla who led the distribution of the cash incentives, which was also timed for the Culmination Program of the Annual Children Month’s Celebration, at the Visayas State University (VSU) Gymnasium in Baybay, Leyte, said the cash incentives given yearly cannot at all suffice the sacrifice the workers give to provide child care and education to the young ones in their respective barangay. “We know this is not enough to compensate for the duties you have done but the province and the people are grateful to all our day care workers for the hard work they give year in and year out,” Gov. Petilla said during his speech. He likewise commended day care workers who have served 20 years taking care of day care children in their barangays. Meanwhile, he reiterated the importance of Early Child Care Development and the role they play in it. Under the program he said, day care workers play the role of shaping the children early on in their years and provide them with mental stimulation, cognitive skills development, physical development and values formation. He added that there are other programs being pursued by the provincial government for child care development which is the nutritional feeding program to lessen the number of malnourished children in the province. Early child care and development, he added, is important as studies have shown that the brain development of a child starts from 0 to 6 years old. Home-based and public day care center workers must have the proper skills, modules and training to be able to run these facilities, the governor said. Also present during the distribution of cash incentives in Baybay were Vice-Governor Mimietta Bagulaya, Leyte 5th District Representative Carlos Cari, Board Members Carlo Loreto, Florante Cayunda Jr. and Margarita Cari, Baybay Mayor Carmen Cari and Vice-Mayor Michael Cari. CAMP LUKBAN, Catbalogan Samar – Army troopers from the 52IB of Purog detachment headed by Ssg Paras apprehended a certain Reynaldo Derio alias Noknok believed to be a member of Private Armed Group (PAG) of unknown political leader at Brgy Bocawe, Gandara, Samar on November 28, 2010 at 3:00 a.m. Guided by information from concerned citizen of the said barangay, the Army troops conducted strike operations in the area of Brgy Bocawe, Gandara, Samar that resulted to the apprehension of Derio and the recovery of one AR 15 Colt M653 Cal 5.56, and one Colt Combat Commander Cal.45 pistol. The campaign against Private Armed Groups is one of the current efforts of the 8ID following the directive from President Benigno Aquino to get rid of these groups that threaten the security situation in the AOR. Through the support of the local folks in providing timely and accurate information and the enhanced coordination between the Army and the civilian populace in the area, 52IB had succeeded in the said operation. The massive information drives conducted by the 8ID have immensely enlightened the people of Samar, on their roles in our security efforts that have made them our significant partner in our thrust to eliminate the lawless elements and communist terrorists to include Private Armed Groups. Maj. Gen. Mario F. Chan, the 8th Infantry Division Chief commended the concerned soldiers and CAA’s of 52nd Infantry Battalion for a job well done of protecting the people, and likewise expressed his gratitude to the people of Samar for their wholehearted support to the intensified security operations that the Army is currently undertaking. CAMP LUKBAN, Catbalogan, Samar – The troops of Alpha Company of 87th Infantry battalion under 1st Lt. Taguinay L Agoy while acting on the reported presence of armed Communist Terrorists as reported by civilians through a text message, encountered more or less eight CTs one kilometer from the village on November 29, 2010 at 1:32 p.m. Accordingly, the said communist terrorists’ presence in the area was for the purpose of collecting food stuffs from the populace as scheduled. The said encounter happened while the troops were conducting combat and clearing operations at vicinity Brgy. Osmeña, Las Navas, Northern Samar. Fire fight ensued for about five minutes, after which the CTs scampered to different directions dragging with them their wounded members. No one was hurt on the government side. The encounter is a product of a timely information provided by the local populace who are against the CTs’ harassment and extortion, a clear manifestation that they desire peace and stability in their area. Earlier on the same day, elements of Army’s 34th Infantry Battalion under 2nd. Lt. Glenn De Ramos while conducting combat operation discovered an abandoned camp of New People’s Army at Brgy Anagasi, Paranas, Samar on November 29, 2010 at about 7:28 a.m.
Said abandoned camp has two halls (bulwagan) and has 80 bunkers that can accommodate more or less 80 Communist Terrorists (CTs). According to Lt. Col. William Peñafiel, 34IB’s commanding officer the abandoned camp could be an alternate camp established before by Regional Guerilla Unit of Eastern Visayas Regional Party Committee (EVRPC) operating in the area that they utilized in case of discovery of their main camp. The troops of 34IB and 87IB are currently conducting pursuit operations against the fleeing terrorists. Lt. Gen. Arthuro B Ortiz, Commanding General, Philippine Army sent a congratulatory message to Maj. Gen. Chan of this result. Similarly, Major General Mario F Chan, 8ID chief, commended the troops for timely responding to the report from the concerned civilians. He also extends his appreciation to the people of Samar for their support and cooperation given to the operating units of 8ID by pointing out the exact locations of the CTs operating in the area. QUEZON CITY – Dasmariñas City Rep. Elpidio Barzaga Jr., a former prosecution lawyer for 22 years, has offered "practical and sensible" ways for the court and the Department of Justice (DOJ) to accelerate the resolution of the Maguindanao massacre. "A year after the carnage, out of the 196 individuals supposed to face trial, only 82 have actually been apprehended, leaving 114 others still subject to arrest and arraignment. Only 15 individuals are in fact undergoing trial," Barzaga lamented. Barzaga recalled that shortly after the 1986 EDSA Revolution, he had the opportunity to handle high-priority consolidated cases before the Sandiganbayan. To quicken the proceedings then, he said the Presiding Justice of the anti-graft court scheduled continuous morning and afternoon hearings every day over one week of each month. -That the photographs of the 114 individuals supposed to face trial but who remain scot-free be published in the newspapers with ample rewards for information leading to their capture. In a recent Social Weather Stations survey, the public gave a poor net rating of -12 percent to government efforts to resolve the Maguindanao killings with justice, with 47 percent dissatisfied, and only 35 percent satisfied, with the handling of the case. A separate Pulse Asia survey showed that while an overwhelming majority of Filipinos believe there would be justice for the 57 victims of the mass slaughter, 83 percent also bewailed that the case was moving "slowly or very slowly." Barzaga expressed confidence the public's negative perception of the handling of the case would be rectified "once they see that no effort is being spared to quickly resolve it with justice." He said a swift prosecution would satisfy not only the public's agitation for a prompt judicial resolution, but also the constitutional right of those accused to a speedy trial. Without observing the appropriate procedure in expediting the proceedings, and with some 600 witnesses lined up to be presented, Barzaga warned it could take several years before any case could be submitted for decision. Over an extended period, he said potential developments such as the presiding judge getting promoted, or the prosecutors becoming judges, could further stall the proceedings. "Based on my experience, long delays also tend to make it more burdensome for witnesses to appear in court, due to developments in their personal or professional circumstances, among other reasons," Barzaga said. CATBALOGAN, Samar – Double event, double celebration. The Waray-Waray Youth Advocates (WARAYA) and the Family Planning Organization of the Philippines – Samar Chapter (FPOP-Samar) have prepared a 10-day signature campaign starting on December 01, 2010, in time for the World AIDS Day Commemoration; and will conclude on December 10, 2010, which happens to be the Human Rights’ Day Celebration. 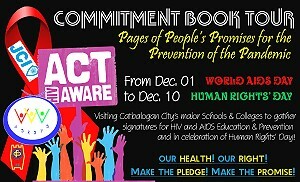 Entitled “Commitment Book Tour: Pages of People’s Promises for the Prevention of the Pandemic”, at the center of the campaign is the Commitment Book which shall be brought to select schools and colleges to gather signatures in support of the HIV and AIDS Education and Prevention. The book tour will end on December 10, 2010 in time for the Human Rights’ Day Celebration. While the gathered signatures are to symbolize each signatory’s pledge of commitment, the Commitment Book is supposed to symbolize the spreading of awareness about HIV and AIDS as a collective goal to be shared by everyone. The campaign’s conclusion on another international event – the Human Rights’ Day – is also a way of emphasizing human rights as an important angle of the HIV and AIDS awareness campaign. It is meant to convey that access to information and services for the prevention and management of the disease is a right that everybody is entitled to regardless of gender, status or religion. The schools that will serve as stopovers for Commitment Book include the Silanga National High School (December 01), Catbalogan National Comprehensive High School / Samar State University - Mercedes Campus (December 02), Guinsorongan Integrated School (December 03), Samar State University - Main Campus (December 06 and 07), Eastern Visayas Regional Science High School (December 08), Samar National School (December 09) and Samar College (December 10). The public will also have the opportunity to sign on the Commitment Book as it makes a stopover at the FPOP-Samar and WARAYA Office during the weekends, December 04 to 05, 2010. CAMP LUKBAN, Catbalogan City, Samar – One (1) homemade shotgun was seized by the members of the Army’s 3rd Scout Ranger Company from New People’s Army’s (NPA) militia following a tip from his former buddy at Sitio Inuman, Brgy Tagabiran, Las Navas town in the province of Northern Samar around 5:20 p.m. of November 22. Based on the report, the troops were conducting security operations in the area to preempt the possible entry of the fleeing terrorist from Pinipisakan Falls when they intercepted a certain Antonio Tan, 19 years old who resides in the mentioned barrio due to his suspicious actuation. Tan after being interviewed by the troops revealed his connection in the underground movement and that he identified 37 other names of his companion in their barrio and in Brgy Sag-od same town. The troops immediately paid attention to Tan’s revelation and visited the persons named by Tan where they captured a homemade shotgun under the possession of certain Santiago Lim, also a resident of Brgy Tagabiran. Tan and Lim were later turned-over in good condition to Leah Danque, Brgy Chairwoman of the mentioned barrio for legal concerns. Troops are now making coordination with the Northern Samar Provincial Police Office (NSPPO) for filing of appropriate charges against the duo. Meanwhile, at around 4:50 p.m. yesterday, 8ID’s 82nd Division Reconnaissance Company encountered undetermined number of NPA in the periphery of Brgy Canlobo, Pinabacdao, Samar following the tip of a forester. Exchange of fires ensued for five (5) minutes after which the enemy fled. No one was reported hurt in the side of the government while still undetermined in the enemy side except that bloodstains splotched in the area of encounter were evident. The troops are continuously scouring the area to track down the fleeing terrorist to immediately bring the possibly wounded foe to the nearest medical facility for medication. In his statement, Major General Mario Chan, 8ID’s commander expressed his great appreciation for the continuous support of the people around. He said that the success of our efforts in winning the peace could be possible with the support of our people even with the people directly connected with them. “I would also like to appreciate our people who exert more effort just to contribute with our aspirations. I just want to reiterate my former pronouncement. Despite of gaining grounds against the terrorist, I am deeply saddened every time I hear stories that another life has to be sacrificed,” says Major General Chan. The Division’s intensified combat operations will continue for those who remain adversative to our Constitution. But for those who really wanted to promote the true spirit of democracy we are more than willing to give you a second chance for the sake of peace and democracy,” concludes General Chan. CAMP LUKBAN, Catbalogan, Samar – The Army’s 34th Infantry Battalion discovered two (2) abandoned camp of the terrorist New People’s Army (NPA) in Barangay Anagasi, Paranas, Samar around 2:45 in the afternoon, November 19. In a report from Lieutenant Colonel William Penafiel Jr, commanding offficer of the 34IB, his troops was conducting security operations when an undisclosed resident of the mentioned barangay tipped off that an enemy haven can be found almost adjacent to their barangay. When the troops proceeded to the area mentioned by the said civilian, an enemy abandoned encampment was found which can accommodate around 20 CTs. It was assessed to have been abandoned for a month already. On the other hand, separate troops under the same battalion discovered another abandoned enemy encampment at Barangay Caguisipan, Catbalogan, Samar same time. The camp has an abundant water source that can accommodate15 rebels believed to have been abandoned also for a month. In his assessment, Lieutenant Colonel Peňafiel said the abandoned encampments projects that the terrorist in the area could no longer establish their safe havens due to the continue and intensified operations being launched by the Division. “34th Infantry battalion is continuously and seriously doing its job to protect and defend the people and the state as mandated by the people and the constitution. Samarnon can enjoy the freedom, peace and free from atrocities of CPP/NPA/NDF,” Lieutenant Colonel Peňafiel says. He further said that with this development, the people of Samar will soon enjoy the freedom and democracy that they’ve longing for years. Meanwhile, Major General Mario Chan, Commander of 8th Infantry Division lauded his troops for a job well done and assured the people that the 8ID will continue to protect the people of Samar and whole of Region8. QUEZON CITY – One of the main authors of the still controversial reproductive health bill expressed disappointment on the recent declaration of Pope Benedict XVI on condom use. Garin who is a medical doctor has been exposed to real life experiences where innocent children are infected with HIV and AIDS because their parents failed to use anything for protection. “My heart bleeds for these children, they are innocent ones and they are just victims by circumstances,” explained Garin. However, in the midst of the seemingly never-ending controversy, Garin remains unmoved and still strongly pushes for the passage of the reproductive health bill. “As a responsible legislator, I owe it to Filipino people to continue on pursuing this advocacy until such time that it becomes a law so the Filipino people will have the opportunity to live quality lives and enjoy the benefits of reproductive health,” said Garin. Meanwhile, Garin appeals to the Pope and to Catholic leaders to accept the reality and heed the call of the majority of the Filipino people who has been clamoring for reproductive health education and services. “We owe it to them,” Garin concluded.